Sew, Art & Chat is our Guilds very social day - bring your hand or machine sewing project along, a good day to relax and do your own thing. Opportunity to bring your sewing machine (remember to bring an extension cord), we have large tables available to spread out your project or to cut fabric. If you are so inclined, a sub-group meets to explore Art quilt techniques. 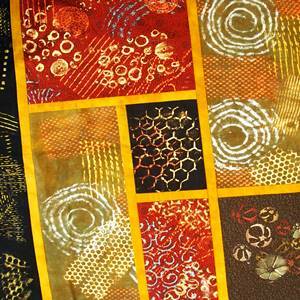 Learn how to make your own stamps to use when creating your art quilts or unique fabric. Sew, Art & Chat Challenge for this month is "Spring Carnival".